UFC officials have announced two additional bouts for the UFC 158 card that’s set for March 16 in Montreal, Quebec, Canada. A lightweight matchup between John Makdessi and Daron Cruickshank and a middleweight bout between Chris Camozzi and Nick Ring.UFC 158 will be headlined by the UFC welterweight title fight between Georges St. Pierre and Nick Diaz and will take place at the Bell Centre. 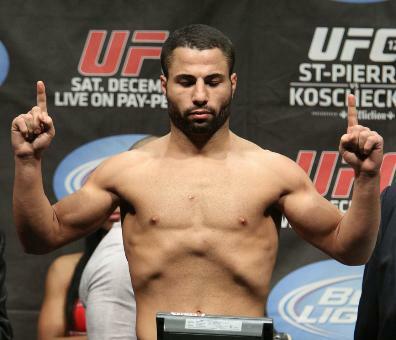 Makdessi (10-2) is coming off an impressive unanimous decision win over Sam Stout in his last outing in November. The win ended a two fight losing streak and was the third UFC win for the Canadian. Cruickshank (12-2) is coming off a highlight reel headkick KO win over the granite chin of Henry Martinez in December. It was his second win in the UFC for the TUF Live alum. Camozzi (18-5) has won three consecutive fights in the UFC and last topped Luiz Cane at UFC 153 via unanimous decision. Ring (13-1) will be coming off a unanimous decision win over Court McGee in his last outing at UFC 149. Ring had suffered his first career defeat against Tim Boetsch at UFC 135 in the fight prior to that one. Stay tuned to ProMMAnow (www.prommanow.com) for more UFC 158 news and coverage.